Yesterday Twitter rolled out a new redesign focused solely on photos and a number of changes have been made to the way we display our recent snaps, use them to make our profiles look better and upload them to the site. 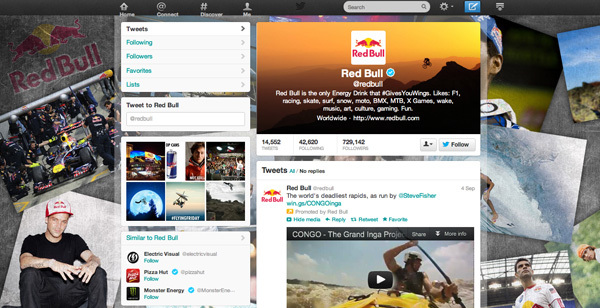 The most noticeable change is the introduction of a new header photo (look at Red Bull’s Twitter page above), which will be visible across all devices and sit at the top right hand side of profiles. Users and companies are able to upload a custom image or select a pre-made theme from the website to use instead. Although all kinds of sites and services have a top banner in this style it’s no surprise a number of commentators have started making comparisons between Twitter’s new header photo and Zuckerberg’s cover photo already. Background images may not look too different, but Twitter has enabled those wanting to get a little bit creative to have more control over the way it’s positioned on the screen, which is great for brands and self promotion. Finally, images that have been recently uploaded will be much more prominent on profiles and interestingly you don’t have the option to upload images with their party sites like Yfrog and Twitpic anymore, you’re forced to do it through Twitter and Photobucket’s service. It’s interesting to see Twitter expand further than its 140 character tweets and much more into the realm of photos, forcing them to take a more prominent position on profiles and giving both brands and individuals alike more freedom to display different images in different ways. As much as we try to embrace change here at Shiny Shiny, we do worry that added features will take something away from a service that’s so popular because of its simplicity and make it more like Facebook. However, as more young people migrate away from Facebook and to Twitter (according to stats earlier in the year), it makes sense for photos to become a firm part of our Twitter experience considering mobile photography has meant they’ve become such a firm part of our lives. We’ve had some problems viewing the new design here at Shiny Media HQ, but just make sure you have the most recent version of the app downloaded and you should see an option to get started and add in your header image if you visit Settings > Design > Customize Your Own. If you don’t see that option quite yet, then just be patient.